Pirate Attacks Decline … but for How Long? After a year of escalating piracy off the Somali coast, during which pirates seized more than 100 large vessels, in early 2009 the rate of attacks decreased markedly. On Feb. 22, pirates captured a Greek-owned vessel carrying coal. Despite this, the first two months of the new year represented a “lull” in piracy, according to the NATO Shipping Center near London. The question is, why? And how long will the lull last? In January, U.S. Navy Rear Admiral Terry McKnight, commander of Combined Task Force 151 (pictured) — a U.S., British and Danish counter-piracy force — chalked up the decrease in attacks to a combination of weather and the deterrent effect of naval patrols. 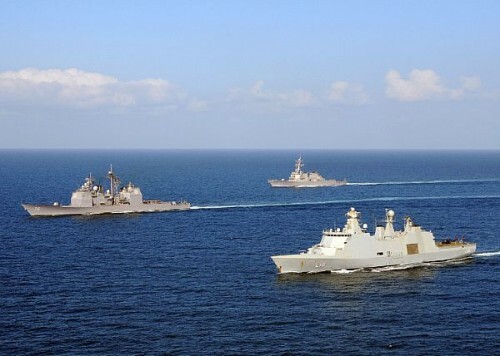 There are now some 20 warships from more than a dozen nations patrolling East African waters, which experiences monsoon winds as high as 15 knots during the winter. “These skiffs that the pirates have are not much bigger than a Boston Whaler, so when the weather picks up, they tend to stay at home and not out here,” McKnight said from his flagship during a teleconference with reporters. The U.S.-based Boston Whaler company is most famous for its 13-foot fishing boats. “But I think the combination of the coalition working together and the maritime community has decreased the pirate activity dramatically over the last couple of months,” McKnight added. Piracy expert Martin Murphy, from the Center for Strategic and Budgetary Assessments in Washington, D.C., agrees with McKnight’s assessment, but adds a note of caution. He says there’s “a fair degree of posturing going on” among the nations and alliances battling piracy, a club that has expanded to the U.S., the European Union, NATO, China, Russia, India, Yemen, Kenya, Japan, South Korea and others. The E.U. force — four frigates from four nations — was launched in December at a cost of $11 million. Read the rest at Offiziere.ch.